You may have noticed that, from time to time, I tend to stretch the term ”Internet” rather wide, when I pick my subjects for the column. When the column started, back in 1998, the Internet was still more or less in its infancy. Cell phones were used to make calls and send text messages. Moving images were viewed on the television screen. But right now we are in the middle of a new revolution – the next level of the information age: New and emerging wireless technologies are enabling content to move freely between platforms. Everything gets mixed together – you can make phone calls on your computer, watch TV on your cell phone, and vote with the same mobile phone for music videos on your TV jukebox. Content is on the move. So it is high time we take a look at portable connected media – phones, computers, gaming consoles and other gizmos that give us news, entertainment, connects us to each other or provide other information. 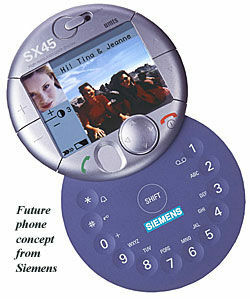 First up: The new generation of cell phones. There are so many models on the market at any given time that finding out what you need can be really tricky. It might be a good idea to look at some of the different primary characteristics of a good mobile phone. Some phones are very good in one department and not so good in others. 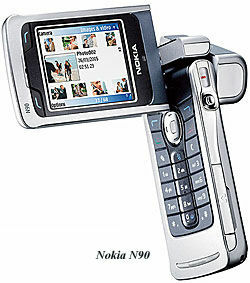 But there are good all round mobile telephones on the market, too. Let’s look at what’s out there. If you are interested in using your phone as a media platform, bandwidth is an important feature for you. Most modern GSM telephones offer EDGE connectivity – a sort of broadband, but not really. But as I write this, the 3G or UMTS network has been opened in Norway and many other countries, enabling 300 Kbit or faster streaming to your phone. This is actually more than enough for most current services, and much faster than EDGE. The problem is that UMTS is still limited to larger urban areas, and you will find that your connection is broken – even when you are making a call – when you move between networks. This can be very annoying, and needs to be addressed by the telecom industry. UMTS isn’t the only broadband technology, however. Some phones are now sold with WLAN wireless chips, so they can act as handheld computers in WiFi-zones, or switch between IP-telephony and regular mobile service. There are no phones like this on the Norwegian market right now. It’s getting really hard to find a cell phone without a camera. And after a few years of grainy, low resolution shots, cell phones are starting to become decent substitutes for compact cameras. What you should look for is generally pixel resolution – now the best phone cameras are around 2 megapixel, which is what you need if you want to actually use it as a camera. It is also a good idea to check the autofocus and zoom functions before buying – these affect image quality almost as much as the resolution. You might also want to look for video capabilities – many phones come with combination cameras. If you are looking for a cell phone that will help you organize your life, what you want is a smartphone or a PDA (Personal Digital Assistant). There is no clear distinction between the two types, but generally is that a smartphone is a cell phone with some software and functionality from a PDA, while the latter is a sort of mini-laptop, sometimes equipped with a cell phone. Both kinds synchronize with your computer. What you should buy depends on your specific needs. If you want to replace your Filofax, you might want to go for a PDA, which typically has a Windows 5.0 operating system, Microsoft Office with spreadsheets, e-mail, and word processing, but is larger and clunkier, with less emphasis on the phone user interface. 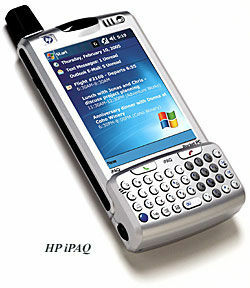 A smartphone, on the other hand, has many of the same features as a PDA, but is smaller, with more focus on text messaging and call functionality. Cell phones have become much more than communication devices. In addition to the different types of functionality described above, many cell phones are made as a sort of entertainment centre – cell phone, iPod, radio and Playstation rolled into one unit. MP3-players are very common, as well as FM radio. Most modern phones now run the Java platform, enabling graphics-intensive gaming, but Nokia have created two phones specifically for portable gaming, to compete with consoles such as Sony’s PSP, Nintendo DS, and Gizmondo – who are planning to incorporate cell phone functionality. It’s not only technological features that make up a phone – how it looks and how easy it is to operate is a big part of it, too. Since cell phones are with us all the time, it is important to many users that they look good, and fit in pockets or handbags without making big bulges. There are many phones on the market that have been constructed with beauty as the foremost design goal. It’s always a matter of taste, of course, but sleek, small, slim silver phones always sell well. In addition – mostly for the adolescent set – you can buy phones with removable covers, with different designs, and mobile jewellery – charm bracelets to attach to your phone. Designers like Versace, Tom Ford, and Philip Starck have all made signature models – reassuringly expensive, of course. The bewildering array of phones on the market may make it difficult to choose a phone that will work just for you. It is always a good idea to check newspapers and magazines for product tests. Most of us need a good all round cell phone – after all 90% of the time you will use the phone to make or receive calls and text messages. If you buy a phone because of a specific advanced feature, you may find that it is impractical in many other areas. The next few years will see telephones develop more and more into content and entertainment stations. I think you will be doing more and more with your phone – including authenticating yourself, transferring funds, hooking it up to the car stereo to play songs from the MP3 archive, and chronicling your kid’s birthday. The line between telephone, TV, and computer will grow even blurrier than it is today. 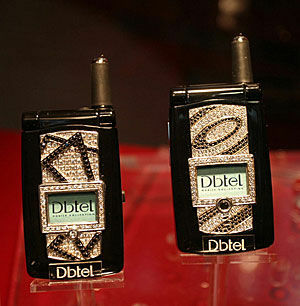 DBTEL, Taiwan’s largest own-brand handset maker, launched a series of handmade diamond phones in January. The gold-coloured item with a sparkling diamond-encrusted flip cover and a three-carat centre piece costs US $28,736. DBTEL is not the first to promote mobile phones as status symbols for the very rich. Nokia, the world’s top mobile phone maker, set up Vertu last year that sells a platinum-encased handset for about $23,800. The Vertu Ascent mobile phone ranks with a fine necklace or expensive watch as probably the most decadent gift you can bestow on your loved one. The undisputed Ferrari in its class, the phone ($3,850) comes with a button connecting you to your own concierge to organise your social life. The Vertu Ascent’s design is characterised by accelerated lines and form, inspired by high-performance luxury cars. The coolest feature of a Vertu phone, however, is its discreetly positioned side key that allows you to connect to the Vertu Concierge service. This team of specialist global advisers is available 24 hours a day, 365 days a year in over 170 countries worldwide and provides the best travel, entertainment and international assistance at the touch of a button.